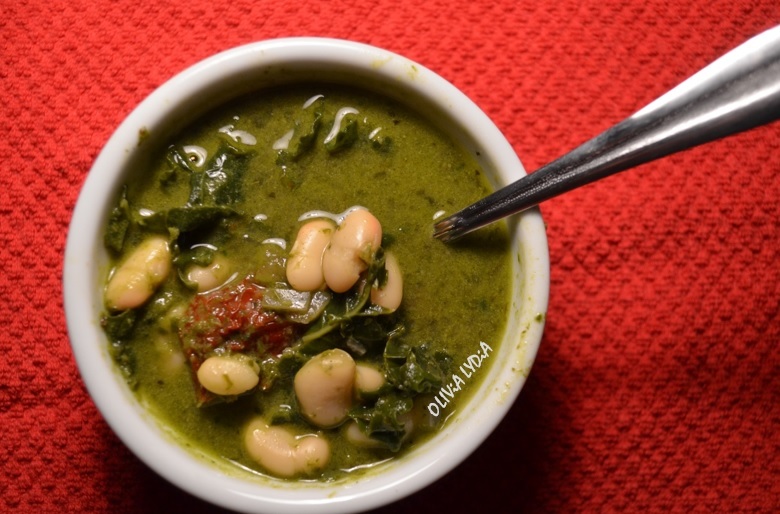 Tuscan Pesto Soup – Olive For Greens. It’s soup season! This Tuscan Pesto Soup is heavenly. I love creating soups because there is so much that can done. This Tuscan Pesto Soup is bursting with fresh flavors that will warm your tummy. The kale & white beans nourish your body with plenty of protein! Eat alongside a salad or a sandwich. Note: If you prefer your own pesto or store brought that is fine too! In a medium pot over medium heat add the olive oil, onion, garlic, salt and pepper. Sauté until translucent. Add the pesto, half of the kale and the veggie cube, if using. Once the kale is softened, on low heat, add the vegetable broth and tomatoes. Cover for 10 minutes. After 10 minutes, add the white beans. Cover for at last 10 more minutes. Tip: The longer the soup simmers the better. But if you are in a rush the times listed above are okay.